When you think you have seen it all at Africa Night, then a very public engagement takes place! As organisers, when you have been doing this for 20 years, you surely should have seen it all, heard it all, experienced it all and done it all. But a guy going on his knees to put a ring on it during an Africa Night is a new one! On the night when Africa Night actually turned 20, (yep, that was during this May edition but the “Big Two O” party is in June) we knew because of the Ramadan, it was not going to be the busiest night ever. But we also knew that many of the guests knew this and if they came they were going to have a good time as always anyway. The only thing was that it took ages for people to show up but in the end more people came than we actually expected. Happily too, 99.9999999% of the guests were dancers and they kept the dance floor busy the whole night! And then came the moment no one was expecting! Meghan and Harry had been married earlier in the day but we had known this for months and no one was there when they proposed to each other. Then this guy with the name of a famous footballer went on one knee to propose to his girlfriend with the name of a famous actress! It was a goose bumps moment. Happily she said yes! Congratulations! We wish them a happy life together and hope when the day arrives, everybody at Africa Night (guests and crew) will be invited to the wedding. Hahahaha. Who needs Harry & Meghan in Windsor when you have these two lovers at Africa Night? In a way, it symbolises what Africa Night has become in the past 20 years. 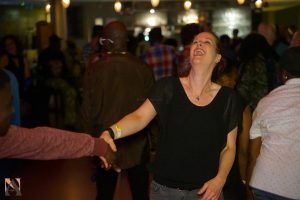 The core reason people come to Africa Night is for the music, to dance and chill. But as the years have gone by, it has become a meeting place for different races, religions, ideas, peoples and more. People have fallen in and out of love with each other, new lifetime friendships have been struck. There are so many children walking around the earth now whose parents met at Africa Night. There have been joy and there have been heartbreaks. We have grown 20 years older and maybe not always wiser but certainly we have had fun all the way. 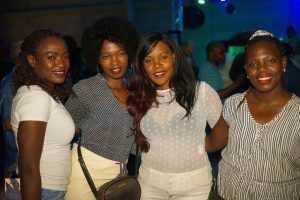 At 20 we are full of energy and as long as we see a smile on the faces of the Africa Night guests, we shall continue to have the strength to entertain them. Thanks to all of you who came this month. Join us on 16 June 2018 for the mother of all Africa Night parties! Keep checking this website and our Facebook pages for the details of the party as they emerge in the coming day and weeks. We are going to celebrate not only that Africa Night turned 20. We are going to celebrate the Africa Night guests and we are going to celebrate love, friendship and much more. We are going to celebrate you! Tagged Africa Night, africa night blog, africa night foto's, Africa Night lovers, afrikaanse dansavond, afrikaanse dansavond tilburg, Meghan and Harry.